Mark George Conservatories is a family run business with over thirty years experience, specialising in the repair, upgrading and supply of bespoke hardwood double glazed conservatories. Recommended by the top conservatory companies in the country, we can deal with all aspects of timber conservatory repairs, including the leadwork. All work is bespoke so we are able to match to any joinery detail or specification required. We offer a unique service in upgrading polycarbonate roofs to double glazed roofs on timber conservatories. No longer will your conservatory be cold, grey and noisy in the rain. Instead, it will be transformed into a warm and tranquil space, that you can use all year round. Although specialists in repairs, should we find that your conservatory is beyond or not worth repairing, we can also provide you with a quotation for a new bespoke hardwood double glazed conservatory. We can either match the new conservatory to your existing design or if you prefer, we can create a completely new conservatory design for you, taking care to complement the architecture and setting of your house but still following the footprint of your existing base. A Mark George Conservatory will include the highest of specifications and we are able to offer a variety of finishing touches for you to personalise the building. Our company also has the experience of our maintenance work behind us to offer you both practical advice and a design which will best suit you personal needs. A Roof Lantern of Glass Roof can be a stunning architectural feature to add light and height to a dark room in the house, making it feel more airy and spacious. We can design a bespoke Roof Lantern to suit you individual needs, incorporating electric roof ventilation as required. 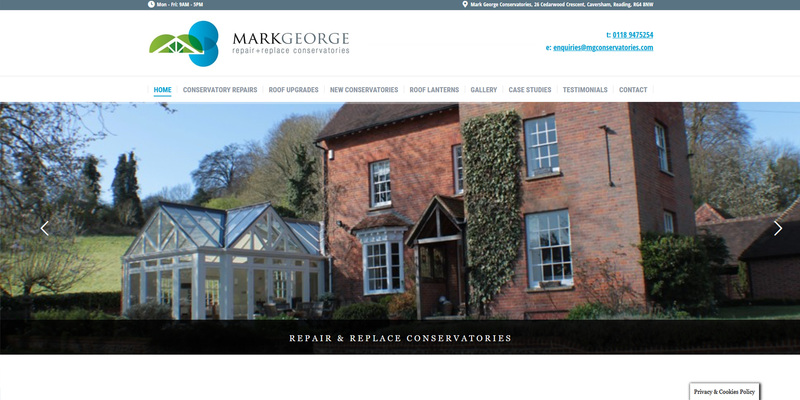 At Mark George Conservatories we are dedicated to providing a personal and professional service to our clients and take every care when working in your home. Mark is a star. Thank you again for bring incredibly professional, as always. Mark and Liam did a great job replacing the glass on our conservatory. Despite a number of unforeseen problems, they managed to get the job done on time and within the original quote. Thanks.